Glendale Raptor's home field, Infinity Park. For player movements before and during the 2019 season, see List of 2018–19 Major League Rugby transfers § Glendale Raptors. Glendale Merlins – known as the Raptors until 2017, when the name was reserved for the Major League Rugby team. 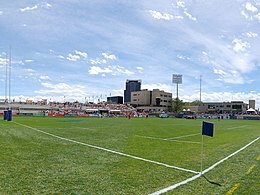 Denver Stampede – the now defunct PRO Rugby team that played at Infinity Park in Glendale during 2016. ^ a b c "Major League Rugby, featuring Colorado team, signs TV deal with CBS". Denver Business Journal. 2017-10-10. Archived from the original on 2018-02-01. ^ a b "City of Glendale made rugby its brand, a move that's paying off with a professional team". The Denver News. 2017-06-02. Archived from the original on 2018-02-01. ^ "Glendale Raptors announce 2018 schedule". 9 News. 2017-12-01. Archived from the original on 2018-02-01. Retrieved 2018-02-01. ^ "2018 Major League Rugby – Glendale Raptors". Americas Rugby News. 2018. Retrieved 2018-12-22. ^ "Glendale Raptors Announce Team, Coaches, & Ticket Sales". djcoilrugby. 2018-01-29. Archived from the original on 2018-02-05. Retrieved 2018-02-05. ^ "Glendale Raptors Major League Rugby Players". Glendale Raptors. Retrieved 2018-02-05. ^ "Glendale Raptors Coaches and Staff". Glendale Raptors. Retrieved 2018-02-05.